Durch die Arty Grilz Challenge Challenge dieser Woche, mit dem Motto "Animals" (Tiere) wurde ich dazu inspiriert mal wieder eines meiner Penny Black Motive hervorzukramen. Ich liebe den kleinen Igel, er ist perfekt für Freundschaftskarten. Die Karte paßt auch zur 4x4 Friday Challenge, die diesmal eine offene Runde machen, mit keinerlei Vorgaben ausser einer 4x4 Karte. The Arty Grilz Challenge of this week with the theme "Animals" inspired me to use one of my Penny Black images again. 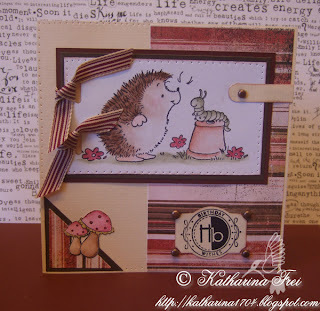 I love the little hedgehog, he is gorgeous for friendship cards! I used my Stampin Up slot punch to do the holes in the image and put May Arts ribbon through. The card also fits the 4x4 Friday challenge, which was an open one. I love the penny black stamp that you've used and as always the layout of your card is beautiful you're so creative. This is not only very cute, but also very nice colors! Another Beauty.. love the colours and the stamp is soo cute!! Mir fehlen mal wieder schlichtweg die Worte. Was für ein süßes Kärtchen. Klasse ich mag deine Arbeiten richtig gern. Cute hedgehog, I like the mushrooms too! I love your card, it's so beautiful !! Really gorgeous card, love the colours & the stamps. Beautiful as always! Such sweet images and great coloring. A pleasure as always to see your work! So sweet! Love every details and the layout! Beautiful card Katharina love the stamp and papers.